FBP V16.1.0 has been released with various fixes and a few new features. Fixed: Hiding “Page stories you might like” type posts and other similar variants on that theme. Fixed: The “Block App” button should now show up again on app/game permissions request pages. Fixed: Hiding “Celebrate “x” day” type posts and also the “good morning / good evening / good afternoon” posts, in the newsfeed if the “Hide Nagging Questions” option (under the “Timeline Options” heading on the FBP options screen) is ticked. Fixed: The green online status indicator dot and the video volume control should now show up if a background colour has been set. Fixed: Hiding “Install Messenger” box in the right column. Fixed: Some hide left column link options were not previously working for those people who have Facebook’s new left column design. New: Hide “Shops” link in left column option under “Hide Left Column Links” heading. New: “Hide Start a Call” Button option under “Chat Options”. New: A preview window is now shown when you select a Custom Reaction Image set that shows you what the Custom Reaction images you have selected look like. Note for Chrome users wishing to update to the latest version of FBP. 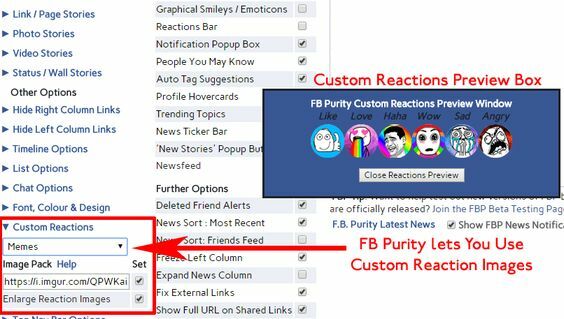 This entry was posted in Facebook, FB Purity and tagged block all facebook ads, block facebook ads, block facebook apps, block facebook games, clean up facebook, custom facebook reactions, custom reaction images, custom reactions preview, Customize Facebook, facebook feed filter, facebook purity, facebook text filter, FB Purity, FBP, fluff busting purity, hide all facebook ads, hide facebook ads, hide install messenger box, hide page stories you may like, hide page stories you might like, hide politics from the newsfeed, hide politics on facebook, hide suggested posts, keyword filtering, newsfeed filter. Bookmark the permalink. 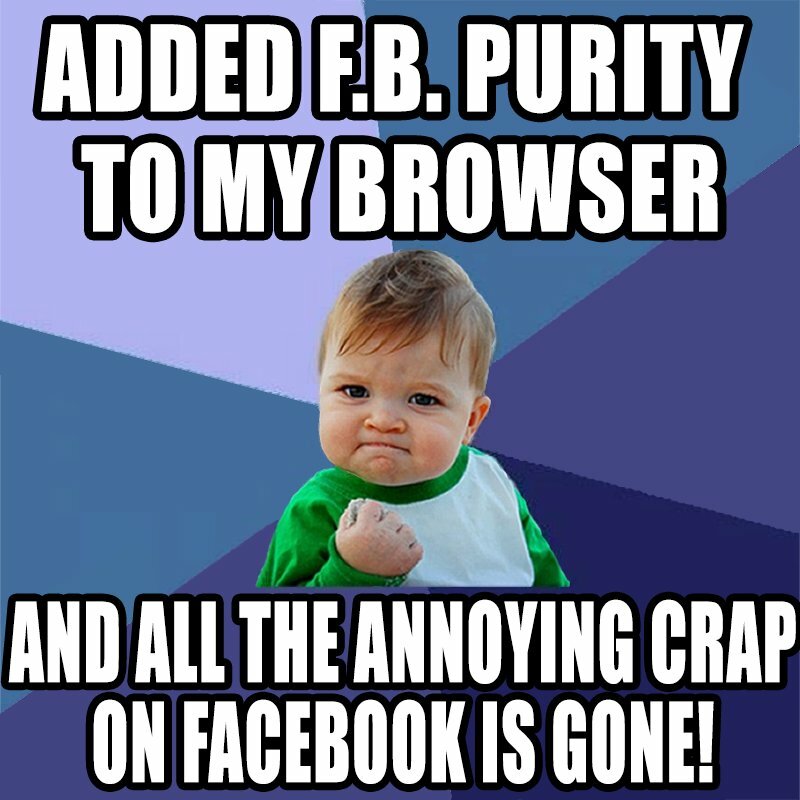 No, that doesn’t work and I don’t want to update Purity because it loses all my settings and I have to start again. How do I hide Page Stories You May Like properly? I have the “sponsored box / posts” option ticked, as well as “recent ad activity” (which is the only thing I’ve seen about ads) and I still see the “Page Stories You Might Like” in my newsfeed. 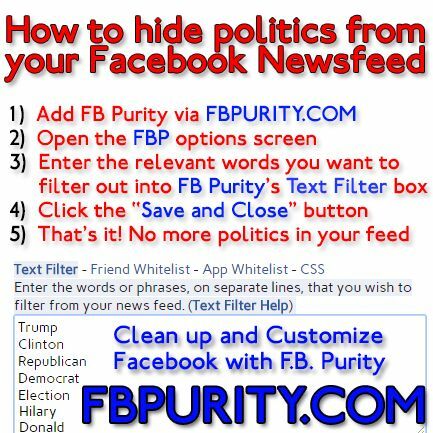 I see no “hide all newsfeed ads” option and I’ve gone over the entire list several times. Not working for me. It’s ticked but “Page Stories You May Like” keeps appearing.